I’m not entirely happy with it, for one thing I think it’s still only a collection of thoughts, but I’ll wait and see what the rest of the group thinks. More time would have been good, but that’s a poor excuse since I started planning it straight away, and have had over two weeks since. Although I’m really keen to get on and start trying to get published, in reality I have to accept that I don’t really have a lot of time, and I might be better to ‘hasten slowly’, and work on improving quality rather than just get stuff out there. I received the gardening magazine I’d subscribed to from the US, in fact not only the magazine but another collection of articles. I sat down and read them both right through almost immediately, and in spite of my reservations above I do think I might try and submit an article I have written. I submitted it for critiquing at last month’s meeting, and most of the comments were positive. I also think that the style of the magazine suits the style of the article, or the other way round. Watch this space! I was turning out some stuff recently and came across some bits of embroidery that I had done years ago when my daughters were young. I took some photos, just for the record, and here is one of them. Again, this is the photo straight as it came from the camera, I should try and see if I can improve it a bit. 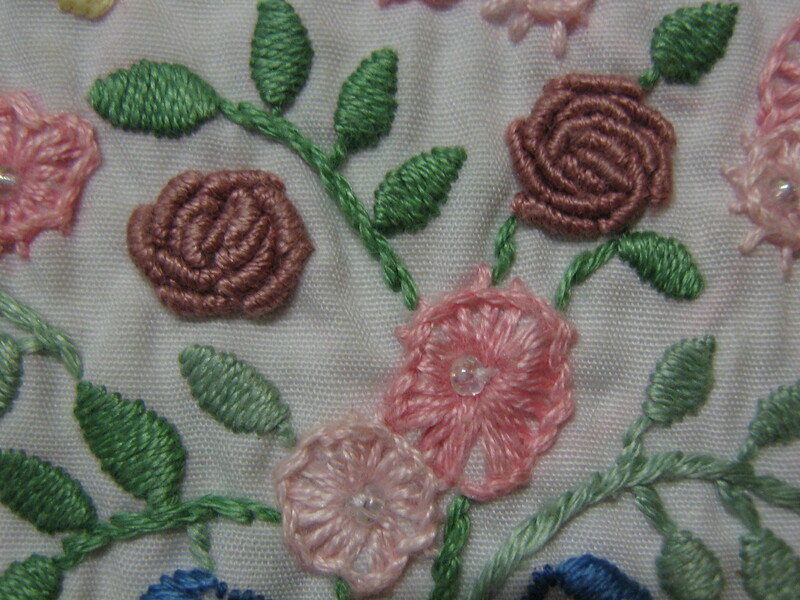 I’d also really like to do some more hand embroidery, having not done much for years, but it’s all about time. I should quit complaining and be more organised, then I’d have time!